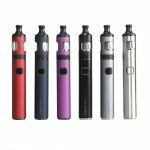 THE INNOKIN ENDURA T18E ADVANCED PERSONAL VAPORIZER IS PERFECT FOR BEGINNERS. GREAT FOR VAPERS. OPTIMIZED POWER OUTPUT AND TANK DESIGN DELIVER AMAZING FLAVOUR AND VAPOUR. EASY FILL, CONSISTENT, LONG LASTING, EASY TO CHARGE 1000 MAH BATTERY. 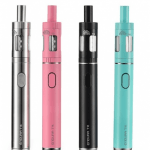 THE ENDURA T20 – NEXT GENERATION FLAVOUR CHASING VAPORIZER. ANOTHER GREAT KIT FOR BEGINNERS. IT’S EASY TO VAPE GREAT! SIMPLY POP THE PROTECTIVE TOP CAP OFF AND POP IT ON THE BOTTOM. THE ENDURA T20-S. YOU’RE GOING TO LOVE THE LONG LASTING & BEAUTIFUL COLOURED FINISHES! THIS KIT IS BETWEEN THE TIGHT DRAW OF M.T.L (MOUNT TO LUNG) AND AIRIER DIRECT LUNG... SO THIS IS IDEAL FOR VAPERS WANTING THE BEST OF BOTH WORLDS. THIS IS A VERY NICE LITTLE KIT. ACTUALLY IT IS A GEM OF A KIT (PUN INTENDED). SMALL, DISCRETE, EASY TO FILL, AIRFLOW CONTROL, POWER CONTROL AND POWER INDICATOR LIGHTS. WHAT'S NOT TO LIKE. THE ENDURA T22E IS CRAFTED WITH TOP QUALITY MATERIALS. 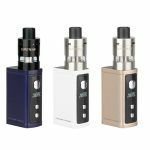 THE INNOKIN ENDURA T22E VAPE MOD IS A 1 BUTTON, EASY TO FILL & EASY TO USE COMPACT PERSONAL VAPORIZER THAT IS LONG LASTING AND AVAILABLE IN THREE GREAT LOOKING FINISHES. 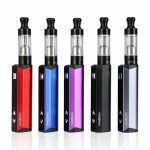 THE ITASTE KROMA STARTER KIT FEATURING THE SLIP STREAM TANK. 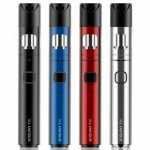 A COMPACT AND STYLISH MINI MOD THAT FEATURES UP TO 75 WATTS OF TEMPERATURE CONTROL POWER THE ITASTE KROMA STARTER KIT IS AN ERGONOMICALLY DESIGNED EASY TO USE VAPING SYSTEM THAT IS PERFECT FOR BEGINNERS WHO ARE LOOKING TO TRY A SUB OHM DEVICE. THE KROMA ZENITH IS AN ULTRA COMPACT , RAPID RESPONSE VAPORIZER WITH 75 WATTS OF TEMPERATURE CONTROLLED POWER IN AN ULTRA COMPACT, HIGHLY ENGINEERED 72MM DESIGN. DESIGNED FOR MTL AND DL VAPORS. THIS IS THE LITTLE BROTHER (OR SISTER LOL ) TO THE THE KROMA ZENITH. IT USES THE SAME COILS AS THE KROMA ZENITH BUT IT IS MORE PETITE. FOR THOSE WHO WANT THE SUPERIOR FINISH, VERSATILITY AND CONVENIENCE OF THE KROMA ZENITH IN A SMALLER VERSION. COOLFIRE IV MINI PACKS 40 WATTS OF PRECISE OUTPUT AND A REAL 1300 MAH BATTERY INTO AN ERGONOMIC SHAPE THAT IS ONLY 63 MM TALL AND DESIGNED TO FIT PERFECTLY IN YOUR HAND! THE NEW CURVED BUTTON DESIGN IS MORE COMFORTABLE THAN EVER AND THE BRIGHT OLED CLEARLY DISPLAYS ALL IMPORTANT VAPING INFORMATION. THE COOL FIRE PEBBLE STARTER KIT FEATURING THE SLIP STREAM TANK AND A 1300 MAH BATTERY. 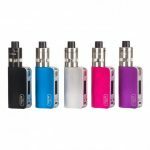 INNOKIN’S MOST COMPACT MINI MOD FEATURING UP TO 50 WATTS OF POWER!! 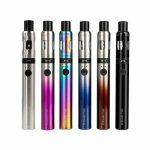 THE COOL FIRE PEBBLE STARTER KIT IS ANOTHER EASY TO USE BEGINNER SUB OHM VAPING SYSTEM. CHANGE COMES FORM WITHIN. SOME OF THE MOST PROMINENT FEATURES OF THE PROTON INCLUDE A BRAND NEW 235 WATT CHIPSET, A LARGE AND ERGONOMIC SIDE FIRE PANEL AND A FIRST OF IT'S KIND JOYSTICK-STYLE SELECTOR.